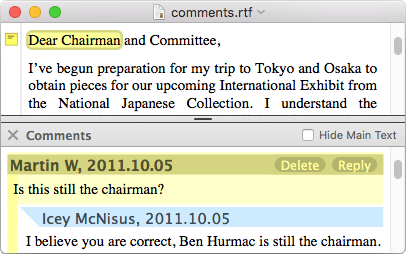 Nisus Writer helps reduce clutter by organizing comments into threaded discussions, where replies to previous comments are shown as a grouped stack. Comments and comment conversations are compatible with Microsoft Word and other software. Comments can be included in any printouts or PDFs you create. Optionally number such comments to aid in matching them to the text they comment upon. 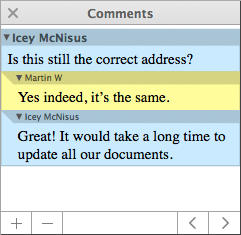 Use our new split view feature to show comments alongside your document text. Synchronized scrolling can automatically keep related text in view. Comments in split view mode can also be used for note-taking or pre-writing purposes. You can quickly toggle whether any attached comments are displayed or remain hidden. Comments can optionally automatically reposition and fade out as you move around the document, helping you focus on your current editing location. Scan through a document for comments quickly using jump to next/previous commands. Export all comments as a separate document. 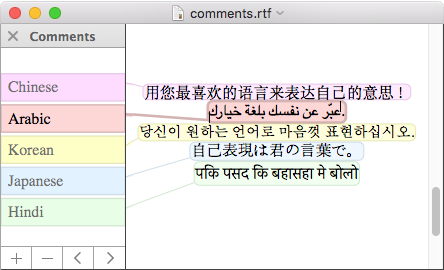 Inobtrusively show comment locations using gutter icons and text highlighting. Search for matching find results only in comments, ignoring the main text. Read more in our user guide's help topic about Comments. Browse the entire user guide online, or download the full PDF User Guide.